I have no problem using corn syrup in baked goods where the texture (like the gooey stickiness of this pecan pie, or the lovely pull of the caramel in my millionaire bars) benefits from it. Also, a lot of things that aren’t particularly good for you, when used in moderation, aren’t actually that bad for you. Also, remember, corn syrup is not high fructose corn syrup. Reasons why I love this particular recipe? First, the all-butter crust. I try to use a particularly light hand when mixing the dough for this pie so that it yields a crumbly shortbread-like crust. 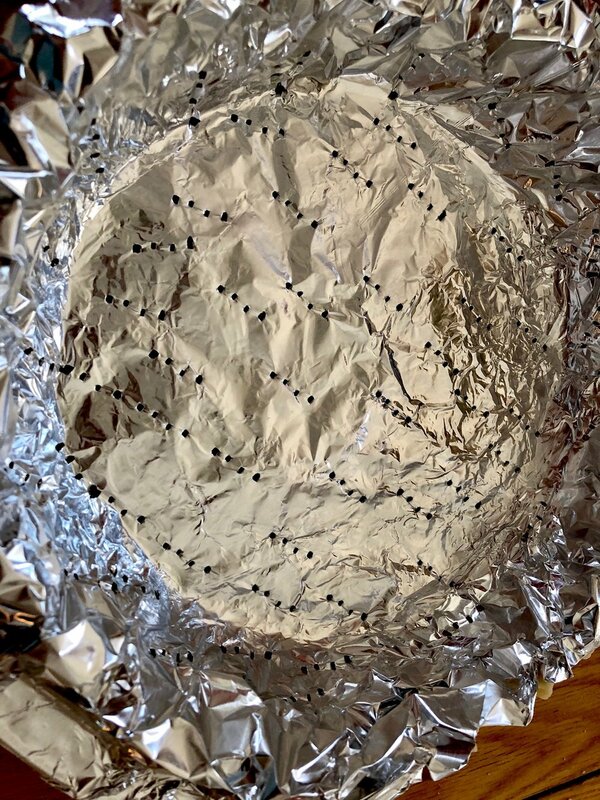 Second, the method for blind-baking here is so simple — no pie weights, simply the added structure of a sheet of aluminum foil to give the crust support until it sets. And on that note…by pricking the crust all over with a fork, not only do you prevent it from puffing up into unsightly deformities, you also allow tiny holes for some of the filling to seep underneath which — hear me out! — transforms the crust into this buttery toffee-like deliciousness. Third, the toasted pecans. Toasting nuts brings out so much more flavor. It’s particularly striking in the recipe below, where the pecans are the predominant theme. You should probably just always toast your nuts. And a note on chopping those toasted nuts: for this pie, I like to chop about 1/3 of the pecans finely, 1/3 roughly, and 1/3 left whole. I like the variety of textures that this method delivers. And finally…the sweetener. For sugar, this recipe uses all brown instead of the more typical white (or a combination of the two), which translates into a richer flavor. And don’t be turned off by that 3/4 cup of corn syrup — it’s less than what most recipes call for (a full cup) and it’s really not as bad as death. It’s actually quite good, when used in moderation. Drizzle in a tablespoon of ice water and cut it in with your pastry cutter (or a couple pulses in the food processor). Continue to drizzle in water by the tablespoon, mixing until the dough holds together when you pick up a piece and pinch it. This should take anywhere from 2-3 tablespoons of water. Dump the dough out onto a clean work surface and use your hands to gather it together into a ball. (You can take your palm and smoosh the dough against the table a few times to help smear out the butter, which will give the crust a little more flakiness.) Flatten into a round disk, wrap tightly in plastic wrap, and refrigerate for 1 hour, or up to 2 days. Prepare crust. Remove chilled pie dough from fridge and let it rest at room temperature for 5 minutes before proceeding. On a generously floured work surface, remove plastic wrap and roll dough out into a roughly 13-inch diameter circle. Gently lift up, wrapping around your rolling pin if needed, and lay out in bottom of a 9-inch pie pan. Press lightly so that it lays flush against the bottom and sides of the pan, trim the overhanging dough to about 3/4 inch all around (use scraps to patch any cracks or thin spots) and flute the edges. Prick all over with a fork. Place in fridge until firm, about 1 hour. Once firm, take a sheet of aluminum foil and lay it over the crust, pressing it against the bottom, sides, and over and around the fluted edge. Prick through the foil all over with a fork and return to fridge to chill. Bake crust. Preheat oven to 400 degrees. Bake foil-covered crust at 400 degrees for 15 minutes, until set, pressing down on the foil if it begins to puff up. After 15 minutes, gently remove foil, being especially careful around the fluted edges, and continue to bake uncovered until it begins to turn a light golden, about 10 more minutes. Prepare filing. While the crust is baking, prepare the filling. In a bowl set over a pot of simmering water, melt butter. Stir in sugar and salt until combined. Beat in eggs, and then add corn syrup and vanilla and mix until combined. Continue to stir until mixture is glossy and hot to the touch, about 130 degrees. Remove from heat and stir in chopped pecans. Fill and bake. Lower oven temperature to 275 degrees. Pour the warm pecan filling into the still-warm pie crust. Bake pie at 275 degrees for 50-60 minutes, until mostly set, and only the center jiggles slightly when gently shaken. Cool completely before serving. Enjoy with whipped cream or ice cream on top! Method and filling adapted from Cooks Illustrated.